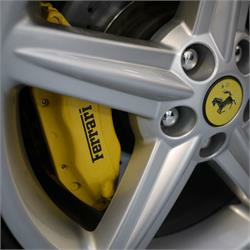 Extreme Protection From Brake Dust & Road Contaminants. Where the rubber meets the road is where the hard work happens. Wheels are subjected to the harshest road conditions, where salts, road grime, grease and brake dust all conspire to cause damage to untreated rims. Without adequate protection, contamination adheres to the surface of the wheel and astringent wheel cleaning solutions may be required to remove them. Alloy Wheel Protection Treatment uses state-of-the-art nanotechnology-based sealants to significantly reduce contaminants ability to adhere to the wheel surface. Brake dust, dirt, water, oils and grime are repelled, making rims easier to keep clean during the weekly wash and negating the requirement for harsh wash chemicals. The sealant forms a chemical bond with the rim to provide a hard, scratch-resistant coating effective up to around 700 degrees Celsius. Wheels treated for ferrous brake dust build-up using a non-contact iron contamination remover. Thorough warm water wash using pH-neutral wheel cleaner, UF Wheel Wash Bucket with Grit Guard & Wheel Woolies. Surfaces clayed to remove any remaining nodular contaminants. Wheels rinsed again & dried using UF Ultra-Soft Microfibre Drying Towels. Rims cleansed with silicone remover to ensure surface is free from any residue, enabling full chemical bonding of sealant to occur. Layer of nanotechnology-based wheel sealant applied & allowed to cure.